Weld tabs for zip ties cleans up your project keeps from having to ziptie around the complete tube. Keeps wiring or hose from moving. Perfect for those small applications that you can never find the right tab for! These Zip Tie Tabs fit a 1/4" wide Zip Tie. These S-Springs are available in two sizes. 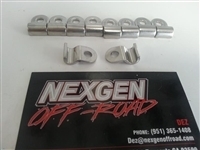 Used with quarter turn panel fasteners. Spring All Non Ejecting.